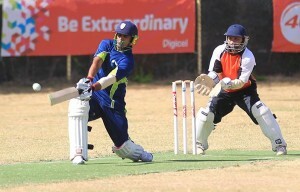 Dhanpaul Chrisnanand crashed 3 fours and 5 sixes in his 51 runs not out to lead the Cavaliers charge. The Vikings Cricket Club are still the only unbeaten team in the Super Six stage of the 2014 Digicel Twenty/20 Cricket Tournament, following their historic victory against four-time defending champions, Cavaliers. On Sunday, April 27, Cavaliers won the toss, batted first and posted 203 for 8 from their 20 overs. In response, Vikings with 206 for 8, overhauled the target in 19.1 overs. Cavaliers opening batsman, Vishaldev ‘Shines’ Bharat on duck, offered wicketkeeper, Anil Mahabir a catch from the bowling of Vaden Walker. Dorian Auguiste and Tajram ‘Teddy’ Nankishore steadied the ship for a bit with a 66-run partnership. Nankishore departed for 48 runs from 25 balls (2 fours and 6 sixes) when he sent a catch to Jnique Mingo from the bowling of Richard Fredericks. Auguiste departed shortly after for 45 runs (4 fours and 3 sixes) when he was trapped LBW by Roy Bobb. Aaron Baker, captain Jagnarine ‘Sugar’ Persuad and Mohamed Hassan departed for 16, duck and 5 respectively. Cavaliers fell to 126 for 6 in the 13th over as Vikings offered few bad deliveries. Three fours and five sixes from Dhanpaul Chrisnanand who top scored with 51 runs not out, lifted the Cavaliers to a dependable total. Bobb picked up 3 wickets for 41 runs from 4 overs and Fredericks, 2 wickets for 31 runs from 3 overs. Walker and Mingo each picked up a wicket. In reply, Vikings seized early momentum as Mahabir and Fredericks staged a 63-run partnership. Mahabir was removed for 23; however, Fredericks, the tournament’s leading run scorer, was eventually removed when Dhanpaul took a sharp return catch. Fredericks crashed 62 runs from 37 balls, including 10 fours and 2 sixes. Despite Vikings slowly reeling in the target, Cavaliers kept picking up wickets, removing Kevin Joseph, Vaden Walker and Vishal Manesar for less than 20 runs. It took the heavy bat of Winston Davis to pull Vikings through. In the waning moments, Davis offered a game-changing catch to Hassan on the boundary, but the ball dropped and with it probably an opportunity for Cavaliers to claim victory. Davis top scored with 70 runs (3 fours and 8 sixes) before he was finally caught by Auguiste from the bowling of Hassan in the 17th over. Vikings needed just 10 runs for victory when Davis was removed. Crowd favorite, Kevin Walker punched the air after he brought the Vikings closer when he smashed the second ball faced for six, leaving vikings just four runs for victory. Despite celebrations, Kevin departed the very next ball and the tension built when Jamal Mikle departed for duck with the score on 201 for 8. However, Vikings held their nerves to win the game. Hassan bowled 3 for 16 from 3 overs. Dhanpaul and Julian Sinclair each picked up 2 wickets bowling for Cavaliers. Vikings had never beaten Cavaliers in a domestic Twenty/20 tournament and the loss on Sunday could not have come at a worst time for the four time-champs who were looking to pick up momentum after dropping their opening game to defending champions, Vincy. For now, Cavaliers are on the outside looking in at the finals and will have to lean on Vincy or Grenada losing another match to have any chance of picking up their fifth title.